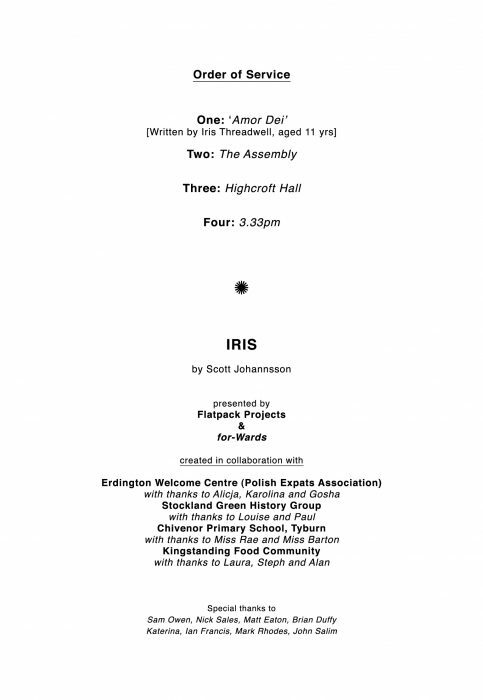 It’s been a few weeks since the performance of IRIS at St Barnabas Church in Erdington – the culmination of months of work with local community groups in the area, gathering sounds and working on musical/text ideas. 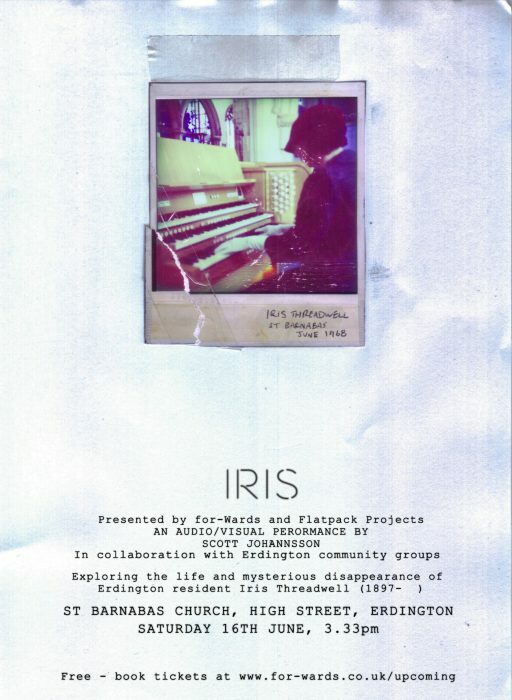 IRIS became something of a multi-media piece, which incorporated field recordings, cut-up voice recordings, vintage electronic instruments, Super 8mm film, and a ‘prepared history’ of Erdington resident Iris Threadwell (1897- disappeared in 1968). 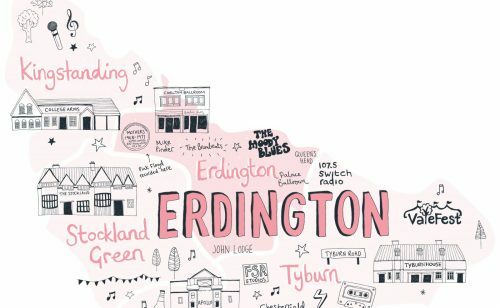 Although the show was presented as being based in history/research into an actual person, it was in fact an entirely fabricated narrative which was used to explore genuine aspects of Erdington’s rich history. It feels like it might be good to now ‘reveal’ some of the actual processes and outcomes which were involved in the creation of the piece. 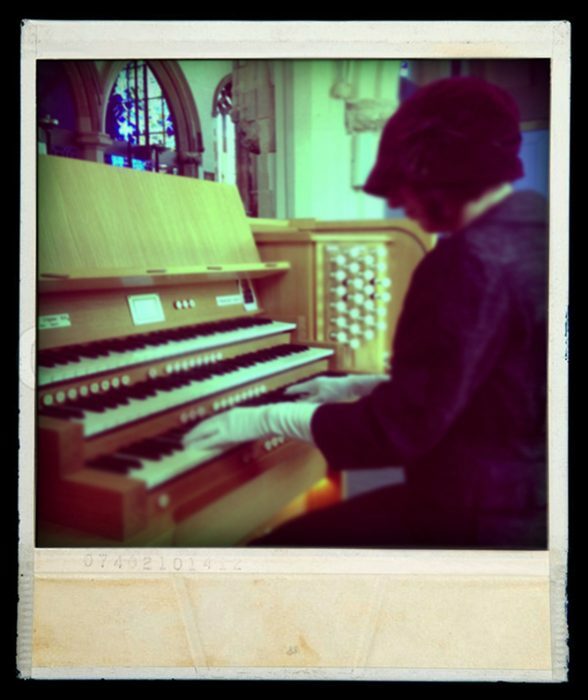 Iris Threadwell was originally created by Scott Johannsson and Matt Eaton (Pram) for a site specific audio visual installation in 2010, part of an exhibition called SECRET LIVES OF A BUILDING. This earlier piece involved live performance, video projection mapping, sound and music, and the creation of an entire history around the character of Iris. Having started working with the community groups, I decided early on that I would ‘resurrect’ and develop Iris’ history with the help of my collaborators – expanding on what we had previously created and drawing the groups into this process of fabricating a narrative around a character yet presenting it as historical fact. 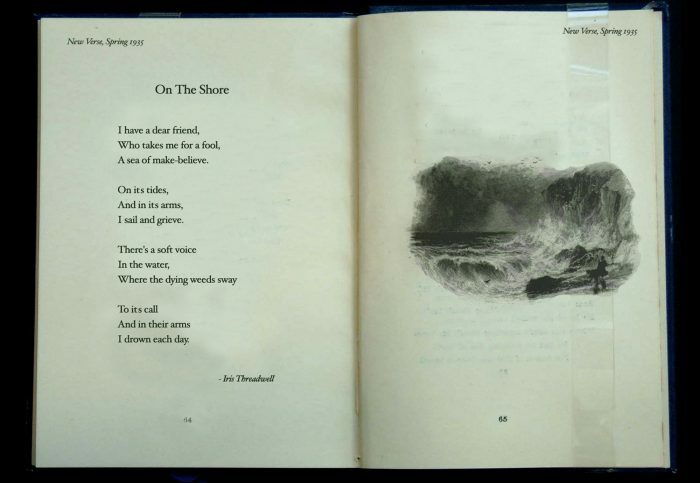 I thought this would be an interesting and unusual process for them to gain insight into, twisting the premise of the for-Wards commission a little to allow for my inclusion of text-based and visual material as well as sound and music. A further co-incidence was that the road I had randomly picked to be where Iris lived in the late 50s (Fentham Road, Stockland Green- behind Highcroft Hospital) turned out to have a special significance. Talking with a about the project, he asked if I had heard the story of Cynthia Appleton. I hadn’t. 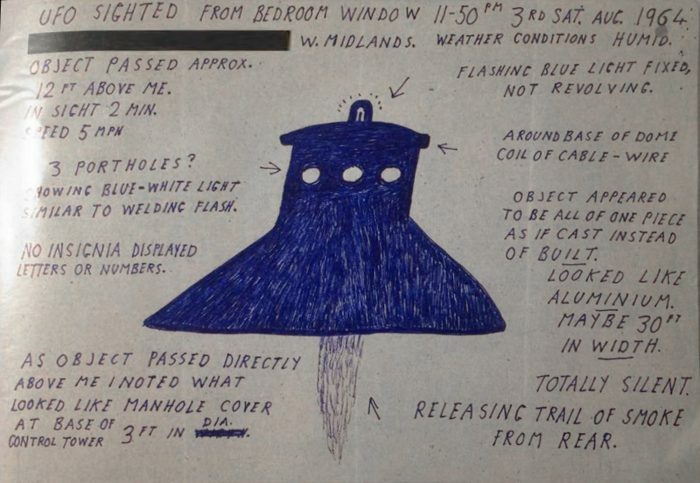 She was an ordinary married Brummie lady who, in 1957 when she was 27years old, claimed to have been abducted by an alien and impregnated with his child. Her entire story is fascinating (and a little sad too). 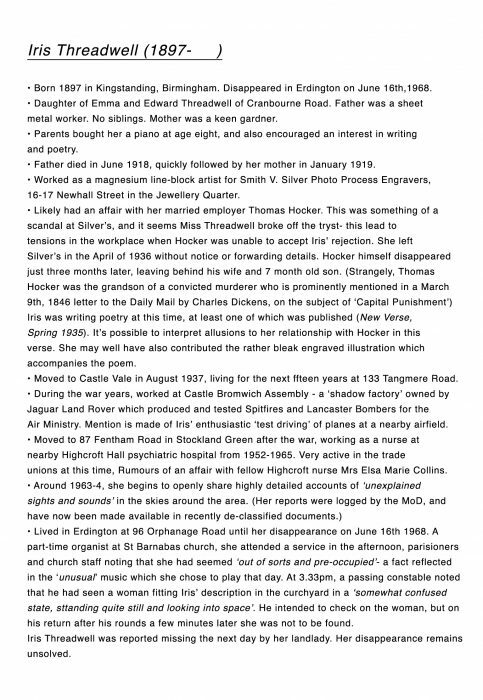 But the thing which freaked me out a bit was that, when I looked into her a bit more, I discovered that at the time of her alien/ufo claims, she was living at…Fentham Road.